entOS 6, in common with most Linux distributions, will happily co-exist on a hard disk drive with just about any version of Windows up to and including Windows 7 and Windows Server 2008 R2. This is a concept known as dual-booting. Essentially, when you power up the system, you will be presented with a menu providing the option to boot either your CentOS 6 installation or Windows. Obviously you can only run one operating system at a time in such a configuration, but it is worth noting that the files on the Windows partition of your disk drive will be available to you from CentOS 6 regardless of whether your Windows partition was formatted using Microsoft’s NTFS, FAT16 or FAT32 file system formats. This installation method involves shrinking the size of the existing Windows partition to accommodate the installation of CentOS 6. How you go about doing this will depend on the version of Windows currently installed on the disk. 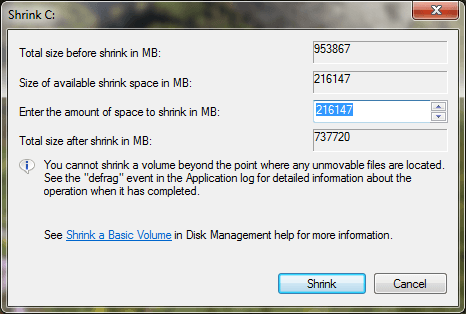 Enter into the Total size after shrink in MB field the new target size for the partition and click on Shrink to proceed. Once the resizing operation is complete, reboot using the CentOS 6 installation media (as outlined in Installing CentOS 6 on a Clean Disk Drive) and proceed with the installation. When prompted to decide on where CentOS 6 is to be installed be sure to select the Use Free Space option. Whilst it is possible to shrink existing Windows partitions using the Windows Disk Management tool on recent versions of Windows, this is not possible from within Windows XP or earlier Windows releases. If you need to shrink a Windows XP partition in order to install CentOS 6, one option is to use one of the commercially available partitioning tools such as PartitionMagic. If you would prefer not to buy a partitioning tool, the repartitioning may also be performed from within the CentOS 6 Live CD distribution using the fdisk and ntfsresize utilities. As outlined in the chapter entitled Installing CentOS 6 on a Clean Disk Drive, a Live CD is a CDROM from which a Linux distribution can be booted and run without the necessity to install the operating system on a disk drive. Before attempting this resizing technique it is vital that you back up all essential data from your Windows system. In this section we will be performing some low level disk partitioning activities using command line tools. Whilst following these steps is an invaluable method for learning about the structure of disk partitions, it is important that you understand that errors in performing the following steps may result in loss of data. With that warning out of the way we can proceed. Once you have downloaded the image, burn it to a CD, then make sure your BIOS is configured to boot from the CDROM/DVD drive before the hard disk and then boot from the CD. The system will boot CentOS and you will have a fully functional CentOS environment to use during the repartitioning process. As we can see, in the case of the above example, we have a single disk drive (/dev/sda) which contains a single partition (/dev/sda1) that is formatted as NTFS (a sure sign that is a Windows partition). 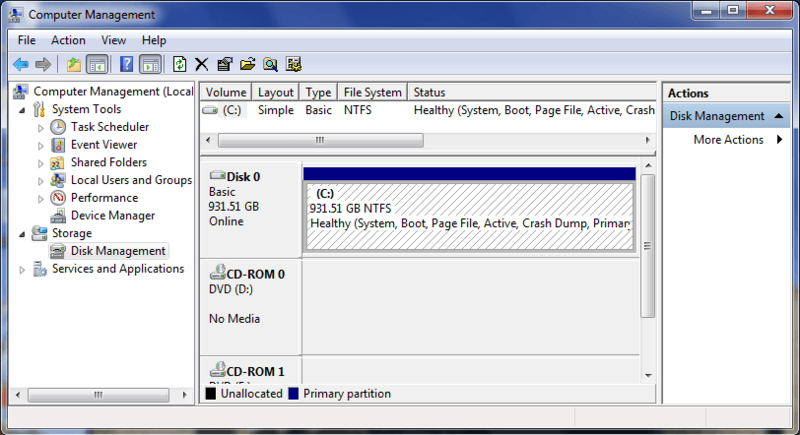 Since the Boot column for /dev/sda1 contains an asterisk we also know this is currently the hard disk’s boot partition. Depending on your system configuration you may see different results (for example if you have multiple disk drives or the disk drive contains more than one partition). You might resize at 3232075776 bytes or 3233 MB (freeing 18227 MB). Please make a test run using both the -n and -s options before real resizing! The read-only test run ended successfully. WARNING: Every sanity check passed and only the dangerous operations left. crash may result major data loss! Successfully resized NTFS on device '/dev/sda1'. You can go on to shrink the device for example with Linux fdisk. Otherwise you won't be able to access NTFS or can't boot from the disk! can recover the partition table by TestDisk or Parted's rescue mode. The resize is now complete and you can reboot the system. If you check the disk volumes in the Windows XP disk manager (right click on My Computer, select Manage and choose Disk Management from the Computer Management tool). The newly freed space will be displayed as Unallocated. Having resized the partition, reboot using the CentOS 6 installation media (as outlined in Installing CentOS 6 on a Clean Disk Drive) and proceed with the installation. When prompted to decide on where CentOS 6 is to be installed be sure to select the Use Free Space option. 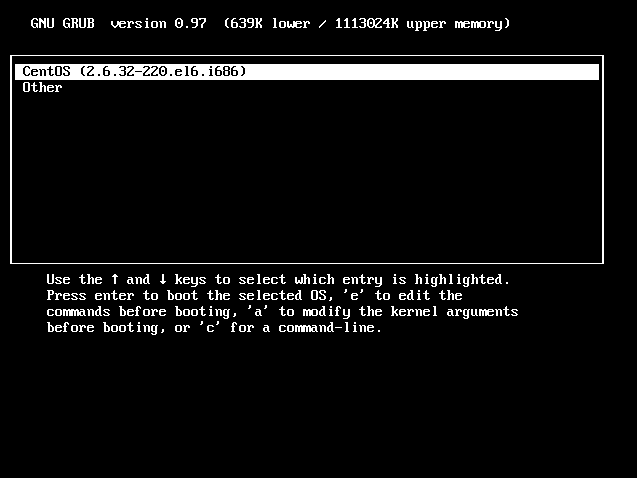 This menu provides the option of booting either “CentOS” or “Other”. In this instance, selecting “Other” will boot your original Windows installation. In the next section we will cover the steps to modify this menu to change the boot default and rename the “Other” menu option to something more descriptive. When prompted by the su command to enter a password be sure to enter the root password created during the installation process, not the password you created for your user account during the setup agent configuration steps. The default=0 line indicates that the first entry in the file is to be the default operating system (in other words, the operating system that will boot by default if the user does not intervene during the boot phase). The timeout=5 directive specifies the number of seconds the boot screen is displayed before the default operating system is automatically booted. Note that the title value can be anything you choose. The next time the system is rebooted, the boot screen will wait 20 seconds before auto-booting. If no keys are pressed the system will now boot Windows by default, instead of CentOS 6. If the user does intervene and display the boot menu, the Windows option is now titled “Windows” and not “Other”. In the above output, the main Windows partition containing the files we need access to is /dev/sda1. This entry was posted on May 2, 2012, 4:25 am and is filed under centos, Server. You can follow any responses to this entry through RSS 2.0. Both comments and pings are currently closed.